Yury Nikulin had the power to bring together some disparate figures – in the Soviet Union and the United States. Who knew that one of the world’s leading military reporters – Michael Gordon of the New York Times –is a fan of the Russian circus? Well, ok, maybe not a fan-fan, but unbeknownst to those who follow New York Times history, the obituary he wrote about the death of the famous Russian Clown Yuri Nikulin was the only one that ran in the Western media, and probably the only arts tribute written by someone more known for counting Kalashnikovs than belting out stories about Russia’s famed buffoonery. So anyway, the story of the obituary: I was living across from the circus in Moscow at the time and one morning I woke up and saw tanks in the streets. I thought there was another coup and the city was being taken over. But no, it was just that Nikulin the clown had died, and in anticipation of thousands of mourners who actually did start quickly arriving upon learning of the news from local media, the circus officials called the city, the city called the army, the army sent the tanks, who were there for crowd control. My news bureau, Newsweek, didn’t want a story on this clown – who was truly a sort of Charlie Chaplin- meets-Robert Kennedy in terms of the attention he commanded. They ran a photo with a caption, but had nothing about what a great guy he was. So I ran to Michael’s office, where he was writing some story on Chechyna or economics or wrapping up some interview with a Very Important Person he had done the day before. In any case, he was busy, he said, when I panted, out of breath, my explanation that Nikulin was dead, and thousands of folks were in the streets, which were, by the way, right outside his office and he just had to write about it. Michael lived across the street from me as well. “Michael,” you gotta see this.” He was, he informed me, on deadline. I understand. A story about a dead clown is not necessarily in the scope of practice of someone who traditionally writes about guns and ammunition for a living. An hour later, I was back. Again my pleas. I didn’t really know anyone else in the American press corps that well. Again his, “I’m busy,” reply. I got it. Deadline is deadline. In American culture, the number three is lucky. I think it has something to do with baseball, our national pastime, but it’s a number that’s always worked for me. The third time I went back to bug Michael, he was gone. “Where is he?” I asked his assistant. “He went to the circus,” I was told. By ‘circus’ he didn’t mean the one next door, where thousands of mourners filed through for two days straight, as Nikulin lay in an open coffin, Russian style. He meant the head administration of the Russian State Circus Company that heads up the 20,000 member arts organization. Apparently my pleas got to him. More likely, the sight of the mourners had too. The next day the obit appeared in the Times. 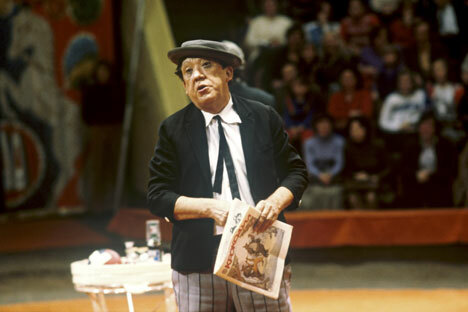 "Yuri Nikulin Is Dead at 75; Beloved Russian Master Comic" was the headline. I read the story. I was impressed. It wasn’t just that he got it. He had gotten it right.